Want to know where GM went wrong and where the heavy slide down the abyss occurred? You need not look any further than the 1986 Cadillac Eldorado. Cadillac which had been GM’s crown jewel since GM’s inception was once as GM called it the "standard of the world". During the 1950s through the early 1980s, this was indeed the case – no other car company in the United States or anywhere in the world could match the exterior styling, luxury, and innovative options that Cadillac offered. However strong competition emerged from Mercedes Benz starting in the 1970s and from BMW in the 1980s. Cadillac had successively kept this new competition in check initially. It had by 1977, downsized its full-size lineup to a more manageable size. The 1976 Cadillac Seville which was the first smaller sized Cadillac, was a massive sales success and helped to keep buyers away from Mercedes dealers. Then a successful downsizing of the behemoth Eldorado occurred for 1979. It seemed as Cadillac entered into the 1980s, all appeared to be going well. Even with the U.S. economy in shambles Cadillac managed to sell 231,028 units for 1980 which was right in the same neighborhood as the 238,745 cars Cadillac produced for the 1970 model year which at that time had set a sales record for Cadillac. Most experts will agree that if Cadillac had kept its car lineup size at 1985 levels – strong sales would have continued. After-all in 1985 Cadillac had a reasonably sized full-size car, a good mix of midsized cars, and even a compact Cadillac called the Cimarron. Cadillac seemed to have all its bases covered and sales for 1985 were very robust at 394,840. Next came the shrinkage for the 1986 model year of its popular upscale models the 2-door Eldorado and 4-door Seville. To say these cars decreased in size would be a massive understatement, these cars shrunk more than anyone could have expected. The new 1986 Eldorado now had a length of just 188.2 inches, a wheelbase of 108 inches, and a width of 71.7 inches. The 1985 Eldorado which had a size that appealed to most buyers had a length of 204.5 inches, a wheelbase of 114 inches, and a width of 70.6 inches. And even this bigger Eldorado was small when compared the last of the big Eldorados – the 1978 model which had a length of 224 inches, a wheelbase of 126.3 inches and a width of 79.8 inches. Comparing a 1986 Eldorado to the 1978 model, one could easily get the impression the entire 1986 Eldorado could fit into the trunk of the 1978. One thing’s for sure, Elvis who was a loyal Cadillac buyer would not have liked the petite 1986 Eldorado – he would have surely spent his money instead on the bigger European luxury cars if he had lived long enough to see the release of the 1986 Eldorado and Seville. Many Cadillac buyers who were used to bigger and more stately cars had a difficult time warming up to the pint-sized 1986 Eldorado. Buyers would have welcomed the car more warmly if it had been marketed as the compact Cadillac and had a entry level luxury car price. Unfortunately that wasn’t the case, the only thing that was big on the Eldorado was its hefty price tag. At a base price of $24,251 it was 14% higher than the much larger 1985 Eldorado. Usually when a new version of a car model is released sales normally increase. Not in the 1986 Eldorado’s case – sales died. Sales of the 1986 Eldorado were at a mere 29% when compared to the 1985 Eldorado. The 1985 Eldorado had been around since 1979 virtually unchanged which for a luxury car was seven long model years. Yet total production output of the 1985 Eldorado which was a little long in the tooth in terms of styling was still a healthy 76,401 units (2,300 of which were convertible models). Cadillac buyers shunned the 1985 Eldorado in droves, with total production being only 22,842 units. And to add insult to injury, Cadillac’s over-downsizing of the Cadillac Seville for 1986, yielded the sam results – a massive drop in sales (total 1986 Seville production was a paltry 19,098 units). To really understand Cadillac’s terrible downsizing mistake of 1986, one must understand that the Eldorado and Seville had been Cadillac’s bread and butter upscale luxury cars since the 1970s. With both being sales flops for 1986, it not only put Cadillac in rough spot but compromised its future as a luxury car sales leader. By 1986 both Mercedes Benz and BMW were offering Cadillac some serious competition. 1986 was also the year Honda launched its luxury oriented Acura brand in the US market. Within a few years Toyota’s Lexus brand and Nissan’s Infinity brand would also be cutting into Cadillac sales which would ensure the further sales spiral of Cadillac. Cadillac’s last rear-wheel drive car and only full-size car ,the Fleetwood Brougham had the same styling that was first introduced in 1980 and used a platform that dated back to 1977. Surprisingly enough Fleetwood Brougham sales for 1986 were still strong at 55,450 units. It would not last since Cadillac would rest on its laurels and not have a new rear-wheel drive Fleetwood model until 1993, so sales slipped. The only car that would keep Cadillac alive during this period was the front-wheel drive Sedan de Ville which for 1986 had sales of 129,857 units. Cadillac unfortunately was stuck with the over-priced and pint-sized Eldorados and Sevilles through the 1991 model year – their sales remained dismal during these 6 model years. Fortunately Cadillac learned its lesson and increased the size of both cars along with improving overall exterior styling for 1992 and sales increased again. Unfortunately it was a day late and a dollar short, the competition from Europe and Japan had by that time taken a big chunk out of Cadillac’s US market share. Cadillac which has slowly rebounded in the last 20 years has never fully recovered from its sales fumble which can be traced right back to the 1986 Eldorado and Seville. Looking back now it’s hard to believe that Cadillac could have been so naive to think that a micro size Eldorado was going to be a big hit with luxury car buyers. However to understand the situation, one must realize that Cadillac had in all previous downsizing efforts encountered much success. It was probably this success that gave Cadillac a false sense of being able to do no wrong. Cadillac was walking a tight rope of trying to please its traditional luxury car buyers along with trying to meet the EPA’s Corporate Average Fuel Economy (CAFE) standards. Downsizing for Cadillac in the past offered the easiest route to meet the CAFE standards. Cadillac being a upscale luxury marque was at a tremendous disadvantage since GM had a corporate policy that it would meet the CAFE standards no matter how what the costs were, and this included an upscale luxury brand like Cadillac was not exempt to this corporate edict. While Mercedes-Benz, BMW, and other luxury brands from Europe didn’t care if they met the CAFE standards during this period, they just passed on the penalty which was a gas guzzler tax to its customers in the form of an addition to the sticker price. For the luxury marques from Europe this was a wise move for passing on the nominal priced gas guzzler tax to its customers allowed it easily gobble up Cadillac’s US market share while Cadillac played by CAFE’s crippling rules. Cadillac playing by CAFE’s rules was the equivalent of a NBA championship game with Lebron James playing with two hands tied behind his back. The net effect was the European luxury cars like Mercedes-Benz, BMW, Jaguar, etc. generally offered bigger and more powerful cars than Cadillac during the mid to late-1980s. And it was a no brainer why many luxury car buyers jumped to these European brands during this time and have never returned to Cadillac. CAFE also had another bad effect on Cadillac, it forced GM brass to mandate that the luxury division by the mid-1980s offer mostly front-wheel drive cars. While the luxury brands from Europe offered mostly rear-wheel drive cars which most luxury buyers preferred. Even today Cadillac still has front-wheel drive brain fog which it inherited from former GM Chairman and CEO Roger "every GM car must be front-wheel drive" Smith. With the release of a new Cadillac flagship car for 2013 called the XTS, which is basically a front-wheel drive car (all-wheel drive is optional) the front-wheel drive mentality is still alive and well at Cadillac. Even the Japanese have learned that if you want to sell an upscale (over $50,000) luxury car it better be front-wheel drive if you want strong sales. Cadillac proves the old adage correct – "the more things change, the more they remain the same". Also worth noting under Smith’s leadership (1981-1989) most of GM’s car lineup was downsized and moved to front-wheel drive. Smith who passed away back in 2007, will probably be most remembered not for the entire fleet of GM cars he shrunk but as the unwilling co-star of Michael Moore’s 1989 film – Roger & Me. The 1986 Eldorado was not a bad looking car, its styling was a pleasant mix of boxy angled lines with some aerodynamic touches. The Eldorado now had flush headlamps (the four quad headlamps were now a thing of the past) and its traditional tailfin taillights were now almost flush with the rear trunk area losing some of the special visual appeal they once had. The longer front hood and shorter decklid styling of the previous generation Eldorado could still be seen however it didn’t look as good since the hood and decklid looked too short in comparison to the bigger area that surrounded the interior cabin – in other words it looked like a little car trying to look big. Fortunately there were enough of those familiar Cadillac styling cues so that in most observers’ minds there was no mistaking this was a Cadillac. 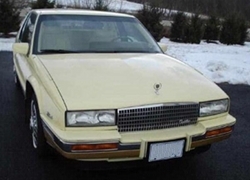 As previously mentioned this car may have been a good seller for Cadillac, provided it had given the boot to its Chevrolet Cavalier based Cadillac Cimarron and replaced it with the Eldorado making it the new budget Cadillac. The Eldorado with most of its luxury features offered at a base price of around $17,000 and marketed as an entry level compact luxury car would have probably enticed many buyers. 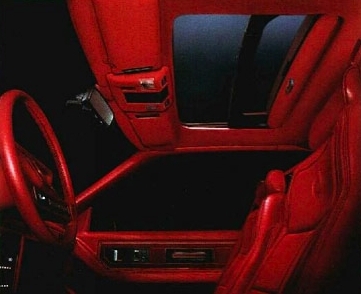 Where the traditional Cadillac buyer was rewarded when purchasing the 1986 Eldorado was in the interior cabin. Cadillac had done a nice job of updating the Eldorado’s interior. For a smaller car it was quite roomy, and you could fit six adults in the Eldorado if the front center console was not ordered. However fitting six adults was a tighter squeeze than in previous Eldorados – the 108 inch wheelbase was little too small to allow for good rear seat legroom. When the center console was ordered the automatic transmission shifter moved from the column to the console where it belonged – the console looked so good Cadillac should have just made it standard. The interior also had all the traditional luxury cues and niceties one would expect from a high-end luxury car but now the overall look of the interior had a more European flair especially when the center console was ordered. It was when the Eldorado was loaded with every power option imaginable including a power operated Astroroof and the "ahead of its time" sweet sounding Delco Bose audio cassette sound system that you realized how nice this interior really was. 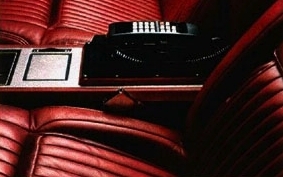 There was even a cellular telephone (which was mounted inside the center console armrest) option which had a hidden microphone between the front sun visors and a hands-free headset. 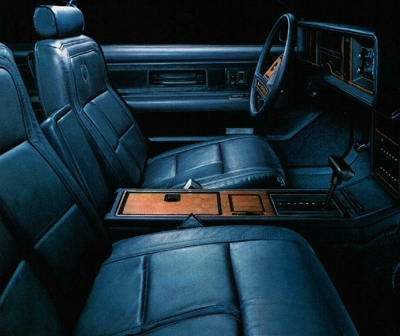 If luxury car status was merely based on just interiors, the Eldorado would have been one of the top luxury car players for 1986. It was in this interior that you didn’t care that the exterior was so small. And it was the small exterior size that also allowed drivers a better view through the front windshield since the traditional extra long hood was no longer there. Previous Eldorados since the 1960s had been front-wheel drive but they all had engines mounted under the hood in the traditonal front-to-back configuration, the 1986 Eldorado utilized the space saving transverse (sideways) engine mounting configuration which most modern front-wheel drive cars now – this allowed the 1986 Eldorado to use a much shorter hood than previous Eldorados. Even with the downsizing, Cadillac tried to maintain decent truck space which was only obtained by raising the decklid height – it worked but at the expense of rearward visibility since the rear window had a shorter height than previous Eldorados. And if a buyer wanted a higher standard of luxury than the standard 1986 Eldorado, Cadillac offered the Eldorado Biarritz model which was the ultimate in interior luxury appointments. Another side effect of CAFE was the shrinking of Cadillac’s once massive iron V8 (which in its heyday displaced 500 cubic inches or 8.2 liters) to the small aluminum HT 4100 (4.1 liter) V8. The HT 4100 which first saw service in the 1982 Cadillac lineup was the only transverse mounted V8 found in a front wheel drive car during the 1980s. The bad news was its anemic horsepower and torque ratings. For 1986 the 4.1 liter V8 which was the only engine available in the Eldorado produced 130 horsepower and 200 lb-ft of torque. Not bad for a front-wheel drive car during this time. 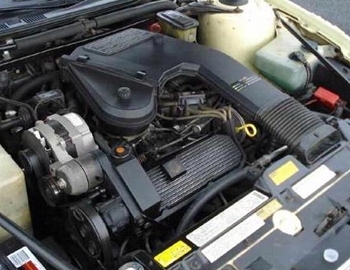 However Buick’s 3.8 liter V6 which was found in assortment of different GM front-wheel drive cars back in 1986, produced more horsepower – 150 horsepower, and 200 lb-ft of torque (which equaled the Cadillac 4.1). Both engines made their maximum torque at a very low 2200 rpm. The main difference between the two was the Buick 3.8 liter V6 used a sophisticated sequel-port fuel injection system versus the Cadillac 4.1’s lower tech throttle body fuel injection system. The one advantage the Cadillac 4.1 had going for it over the Buick 3.8, was since it was a V8 it allowed for smoother and quieter operation than the Buick 3.8 liter V6. The bigger and heavier 1985 Eldorado which used the same 4.1 liter V8 as the 1986 Eldorado, took almost 12 seconds to jog from 0-60 mph whereas the 3,365-lb 1986 Eldorado took close to 11 seconds to complete the same task. This may not seem like a big difference but back in 1986 trimming a second off the 0-60 mph time was a big performance leap. The 1986 Eldorado did feel peppy around town – producing adequate torque off the line and enough grunt all the way up to 4,200 rpm. Above 4,200 rpm the little 4.1 ran out of steam real quick. Cadillac had in the previous generation Eldorado offered an optional touring suspension package that gave the Eldorado European touring car handling attributes. Cadillac continued this trend by offering a touring suspension on the 1986 mode which was leagues better than the offering in the previous Eldorado generation. The 1986 Eldorado’s light curb weight, standard four wheel independent suspension, and standard four wheel disc brakes when coupled with the touring suspension package was a great combination. By far the 1986 Eldorado was the best handling Cadillac to date when equipped with the touring suspension. The touring suspension also was the only way a buyer could get 15 inch wheels on the 1986 Eldorado (standard on the Eldorado were 14 inch wheels with P205/70R14 tires). The touring suspension came with a set of mandatory 15×5.5 inch wheels with performance oriented P215/60R15 Goodyear Eagle GT tires. The suspension was so good for a front-wheel drive car that Cadillac could have carved out a performance reputation for the pint-sized Eldorado had it been able to increase the horsepower of the 4.1 liter V8 to 200 horsepower for 1986 and had it offered a 5-speed manual transmission option. Even with the Eldorado being front-wheel drive, a 200 horsepower around 3,300 lb luxury car with very good handling and a manual transmission would have given the performance luxury cars from Europe a serious whipping. Unfortunately the Eldorado would not get a manual transmission option, it was stuck with just an automatic which fortunately was a smooth shifting 4-speed automatic transmission with overdrive. And Cadillac buyers would have to wait until the 1991 model year for the little Cadillac V8 to reach 200 horsepower when displacement was increased to 4.9 liters (the 4.1 was increased to 4.5 liters for 1988). With the 1986 model year being three decades ago, many of the Cadillac engineers and designers (working under Roger Smith’s direction) who had a hand in the fateful decision to over downsize the Eldorado have retired. Unfortunately the remnants of their colossal mistake still resonate even now in Cadillac’s corridors. For Cadillac it was a bigger blunder than the Coca-Cola corporation releasing new Coke back in the early 1980s. At least Coca-Cola rectified its mistake shortly after making it. Cadillac was very slow to react to its mistake. This is not to say that the 1986 Eldorado was a bad car. For it was actually a reliable car with many pleasing attributes. The problem was perception, the radical downsizing of such a highly priced luxury car turned off most buyers. Today a higher priced smaller size luxury car, the size of the Eldorado would not be shunned the way it was back in 1986 since the public has gotten used to smaller luxury cars over the last three decades. And designers have learned all the styling tricks to make a smaller car look bigger. As an example the 2012 Cadillac CTS coupe is the same length as the 1986 Eldorado, but it looks substantially larger. The CTS fortunately is rear-wheel drive, so maybe Cadillac has learned a few things since the 1986 Eldorado. With that being said, history has put the poor little 1986 Eldorado into a strange position where it’s like Rodney Dangerfield and gets no respect, and most probably believe it never will. Wrong, this is where it gets interesting, in the case of most unloved cars their values even when they reach the age of a classic car are dirt cheap. However that’s not the case with the 1986 Eldorado which the current NADA (collector car price) guide has listed as having an average retail price of $8,900. As an example a 230 horsepower 1986 Chevrolet Corvette (the hottest and most expensive American performance car back in 1986) is currently listed by NADA with an average retail price of $10,000 – only a mere $1,100 more than the 1986 Eldorado. So maybe there’s hope for the little 1986 Eldorado as a future collectable after-all – I bet somewhere out there Roger Smith is smiling and Elvis is turning in his grave.